As with the 12 by 12 tours we show most of the tours graphically, leaving the reader to put in the numbers and check the magic totals if desired. The numbering starts and ends at the cells marked with a black blob. The tours are oriented as they were first published. The magic constant for the 16×16 board is 2056. The earliest known example of a magic knight's tour on the 16 by 16 board was by Maxwell Wihnyk, published in Schachzeitung 1885, and shown in the first diagram here. The tour is constructed by extending the braid of the Beverley tour 27a. For the numerical version see the page on History of Magic Tours. Its diagonal sums are: odd = 1898, even =2090, when numbered from file 12, rank 8. Many other tours of braid type can be formed, in which the arrangement of the braids can be much more free-form, but none of them as far as I know show both diagonals magic. Surprisingly Murray seemed more interested in trying to work out how many tours of these types could be constructed than in finding special cases with interesting properties, though he did place emphasis on the property of each 4×4 block itself being magic, as in Beverley's original tour. 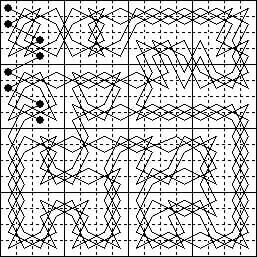 This method, was introduced by H. J. R. Murray in Fairy Chess Review August 1942, where he wrote; The principle of construction ... is really an extension of ... squares and diamonds on the 8 by 8. Take any magic tour composed of squares and diamonds entirely, and insert the moves connecting their terminals on the central 8 by 8 of a 16 by 16 board. Then replace the squares and diamonds by circuits of squares and diamonds round the quarterboard of the 16 by 16 in which the terminals happen to lie. One pair of these is taken clockwise and the other anticlockwise. The parent tour used is 12b. In his 1951 manuscript he explained that the method could also be applied to tours containing beverley or irregular quartes, provided that certain elaborate conditions are satisfied. The main ones being that the parent tour must have X = 60 and N = 20 for every line, and the quartes must all be broken in the same way, either 2 and 2 or 3 and 1. Diagonals; odd = 2432, even = 1680, numbered from i12. H. J. R. Murray died in 1955 and a year later his method was applied by Helga Em. de Vasa and by T. H. Willcocks, who corresponded on the subject, to produce the first diagonally magic knight's tours, which we show in the other three diagrams. The two de Vasa solutions, very similar, based on 00a, were published separately in 1962, one in Les Secrets du Cavalier by G. D'Hooghe and the other in Recreational Mathematics Magazine in an article by Willcocks, who later published his own tour, based on 34d, in Journal of Recreational Mathematics in 1968. Manuscripts of correspondence between Willcocks and De Vasa on this topic were lodged with the Murray collection in the Bodleian Library, Oxford, in 1991. The three tours shown here were used by the editor (George Jelliss) as the illustrations on a Greetings card sent out at Christmas 1991 and New Year 1992. These tours are all diagonally magic and formed by a new method that I called Split and Fix since it involved cutting an existing 8×8 magic tour in half, placing the halves at opposite edges of the 16×16 and joining up the loose ends in a biaxially symmetric pattern, which also meets certain other criteria. The tours used are 16a, 27i, 03b. The biaxial property means that the numbers in the files add in complementary pairs to 257 while in the ranks half add to 193 and half to 321 (adding to twice 257). In the tours derived from 27i and 03b the pairs adding to 257 are symmetric with respect to the horizontal axis. However, in the tour derived from 16a the pairs adding to 257 occupy pairs of adjacent squares. In this tour each connecting strand has a strange type of symmetry, in that if the rth move takes the knight to the mth file then the rth move from the other end of the strand takes the knight to the (16  m)th file. Thus the middle move crosses the vertical median. This ensures that each file that contains k also contains 257  k (in fact they form domino pairs). In these tours the fact that the sections of the split tour do not overlap the diagonals makes it easier to ensure that the diagonals add to the magic constant. Others that I tried with the components differently placed could not be made magic in the diagonals. It may be noted that the Wihnyk tour can be regarded as formed by splitting the Beverley tour and placing the two parts back to back in the centre of the larger board.